Thinking with my hands: Playing with Lego. Got out the Lego. Built all afternoon with RincewindTVD. Built a shared language to describe the pieces too. Iris and Hazel didn't press bits into bits much at all, but Iris has the Hagrid's Cottage that he made beside her mattress tonight (the kids have been sleeping on the floor lately, I don't know why). RincewindTVD built the cottage to the picture, wished he had the instructions to check the hinge mechanism he invented against. Housemonkey built the not quite solid pyramid full of a hidden maze there's only one way through. I want to fill it with pseudo-scorpions. 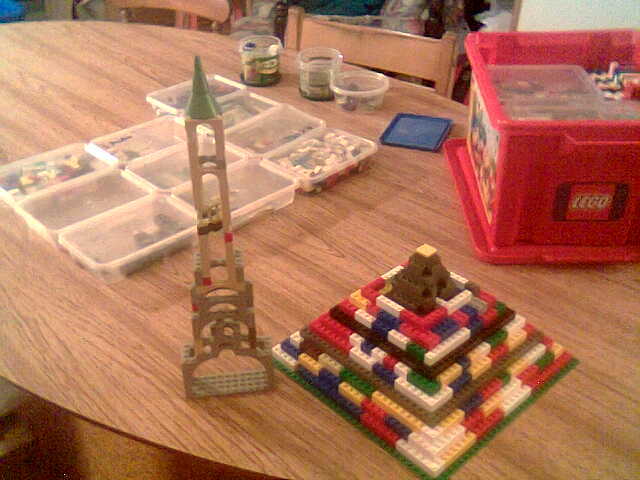 I built the gothic space ship on the left; it's stronger than it looks for all it's humourous sketchy grace and asymmetries. I also sorted the bits into takeaways' boxes by size and shape, laid the boxes in a grid, and then put the boxes into bigger boxes where they fit nicely. It looks like schemas, but we'll have to play with the Lego lots more times to check.